$14.95 (save $3.00). Once it sells, it's gone. We do not expect to restock. 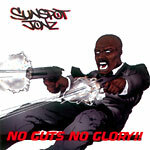 ''No Guts, No Glory'' is part 1 of ''Journey To The Sun'', the new Sunspot Jonz album you've been fiending for! All-new material with beats from a variety of today's dopest producers. Production: tracks 1,2, 5, 7, 8 & 14 Sunspot Jonz; 3 & 11 Moka Only; 4 & 6 Underated; 9, 10 & 13 Simon (aka Johnny Lava); 12 Eligh; 15 Peek-A-Boo.